Grab Bag: Big Saver | CHANFLES! Posted on September 22, 2006 by EL CHAVO! I love the Big Saver on Figueroa and Ave 26, it has a great selection of items and the veggies are always super cheap! This is where many locals who still cook get their staples: potatoes, onions, chiles, meat, nopales, ajo, frutas, and all the other things you can use as ingredients for a meal. Those that tend to warm up their food go to Vons, they have all the deals on the prepared, packaged, or frozen items that have become the basis of the modern american diet. I love being at the Big Saver just to be around other working people that still take the time to make a real dish, people that still care about the quality of what one eats. Occasionally there’s a small conversation about how bad the tomatillos are this week, or the great bargain on mangos, and even sometimes a viejita will let me in on the fact that the freshest dried chile guajillos are over on that corner of the bin: even though the food here is always subpar to the stuff you can get at Whole Foods, most still care about getting the best quality food, at a price they can afford. Unless you are filthy rich, buying fruits and veggies at Whole Foods is an act of restraint, you buy just enough for todays sandwich or for the pretty garnish with which to dress your salad; it’s a place for nibblers, not for cooks. At the Big Saver, you can walk out with 10 bags full of veggies for less than 10 dollars, I kid you not. Enough with the diatribe, here’s some random pics and info about the Big Saver, click ahead if interested. …where’s the damn licor? Don’t tell me you all are too puritanical to paint a bottle of tequilla into the landscape? I’ll give them another month or two, then I take out my paste brush! 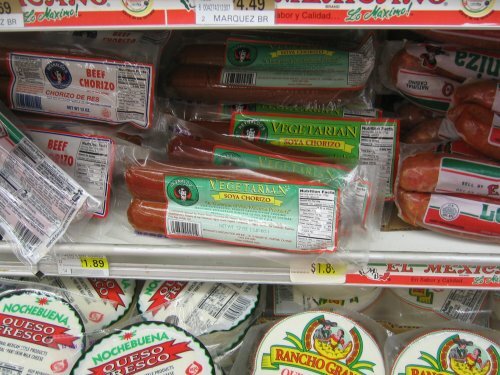 The Great News is that they now carry Reynaldo’s Vegetarian Chorizo! I used to drive down to their factory in Downey just to get some but now it’s around the corner. Reynaldo’s also make real chorizo so they know what they’re doing. That Soyrizo stuff you find everywhere else is crap. 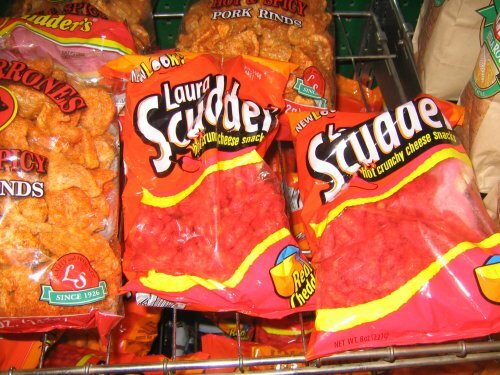 Looks like lady Laura Scudder is muscling in on the Flamin’ Hot Cheetos territory with their own similar product. There’s a chile battle brewing! Though I may taste these eventually just to compare, I promise to stay out of this one: I am tired of the endless wars. When will the snack violence end? 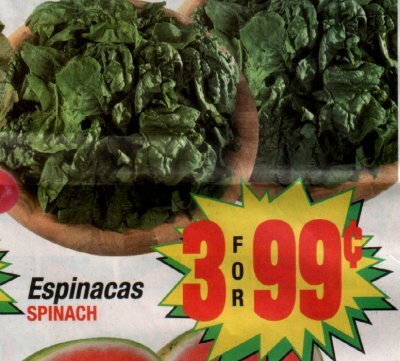 Though the Rancho Market on Broadway is selling spinach at 3 for 99 cents, the Big Saver has them beat. At only 10 cents a bunch I bought me a whole dollars worth, enough for a huge salad and a big pot of spinach soup. You gotta wash the spinach really well or your soup will be gritty, which is never good. I think I had too much salad cuz my stomach is feeling funny, oh well, the soup is ready so that should cure it! Provecho! 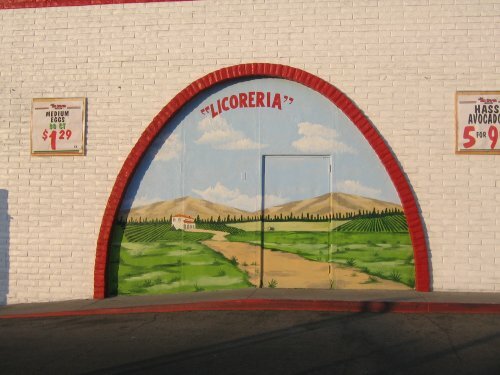 This entry was posted in Fotos, La Comida. Bookmark the permalink. Spinach soup is so good. 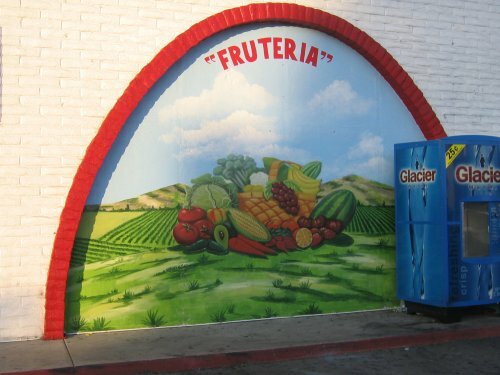 I’m forgetting the name of the place in El Sereno that’s the equivalent of your Big Saver for us over the hill–it’s at the corner of Monterrey and N. Huntington (Rancho Market? )–the produce section usually beats Food4Less in quality if not quantity. They have Reynaldo’s at Beach’s in Rosemead, if anyone out this way needs it. 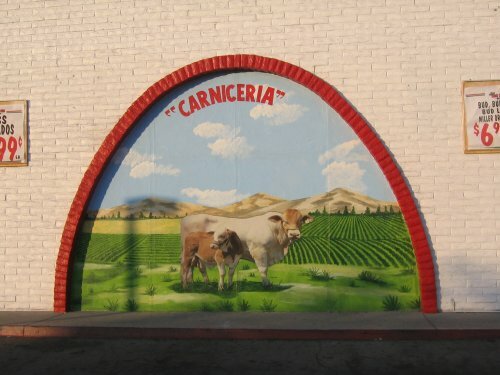 Of course, a mile down the street is the Rosemead Big Saver which probably has the same soyrizo. They probably have the TVP in a bag, too. I guess it really only depends on if you want to listen to new wave 80’s or rancheras as you shop. Despite the non-existence of a Whole Foods, or even a Trader Joe’s nearby, it’s pretty easy to go meatless here. There’s Buddhist vege shops and Mexican TVP, beans, and whatnot.